TMJ dysfunction is a common and very debilitating disorder. TMJ disorders usually begin as pain, clicking and popping noises in the jaw during movement. If not properly evaluated and treated, TMJ problems can continue to worsen and lead to headaches, facial pain, ear pain and difficulty eating. Our Sydney Chiropractor is trained to provide TMJ jaw pain treatment. If you have TMJ dysfunction, every time you open and close your mouth you put wear on the tissues of the jaw joint. TMJ symptoms include noises such as clicking, grinding, or crunching when you open and close your mouth. This can cause severe problems if not treated properly, so it is recommended that you seek treatment. To self test, open your mouth as wide as you can without strain or pain and place the three middle fingers between your upper and lower teeth. If you cannot fit all three fingers and you experience pain, it is possible you have a TMJ problem. 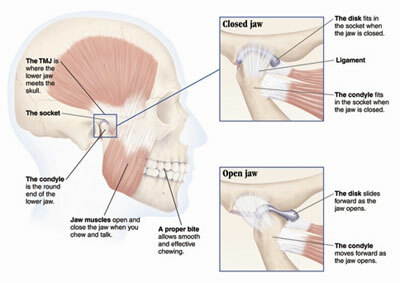 Chiropractic examination and treatment can help TMJ (jaw) disorders. At the Advanced Care Chiropractic clinic, the condition is treated through the use of specific muscle releases, mobilisations and stretching techniques. Various jaw exercises are then applied. Call now, and make an appointment today.